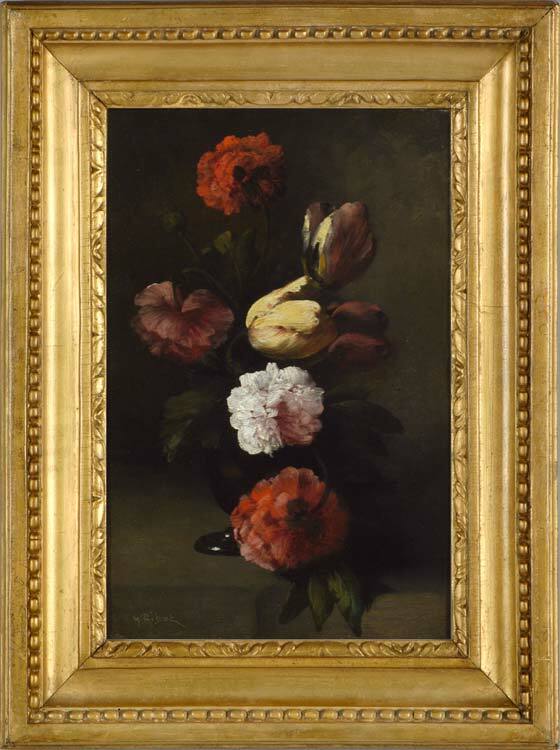 A flowerpiece in the early, shadowy style Ribot learnt from his father, this painting marries the chiaroscuro of a 17th century Spanish or Dutch still life with a contemporary 19th century approach to create a richly decorative work in which the luxuriance and colour of the flowers are held in tension with the dark background and the succulent blacks of the vase. The unusual vertical composition, in which the peonies spill downwards in a swag of voluptuous pinks and reds, adds to the sense that this work is an aesthetic decoration designed to enhance an interior. Ribot was the son of the painter Théodule-Augustin Ribot (1823-91). Théodule was a self-educated artist, who gilded and decorated looking-glass frames in Paris whilst continuing his training in Glaize’s studio, only sending his paintings to the Salon from the 1850s. By the 1860s he was winning medals, his work had been bought by the state and he had participated in international exhibitions; he was awarded the Légion d’honneur in 1878. He taught both his daughter, Louise-Aimée, and his son, christened Clément-Théodule-Germain but usually known as Germain, to paint. Later on the training of the latter was passed to Théodule’s friend, Antoine Vollon, who specialized in still life paintings. Germain Ribot is now also known for his still life paintings, but – like his father – produced some genre scenes. Like his father, again, he showed regularly in the Salon (from 1870 to 1883), and during his early career and the latter years of Théodule’s, their styles overlapped. Théodule had been influenced in his history, religious and genre paintings by Rembrandt and Ribera, and Germain started out with the same tenebrous palette. Later his work, particularly his flowerpieces, would become increasing colourful, as his father’s style was superceded by the example of artists such as Fantin-Latour. Flowerpieces and still life paintings were in great demand during the 19th century; a newly enriched mercantile and bourgeois class wished to emulate the upper classes by decorating their homes with pictures and objets d’art, and the production of moulded composition (rather than carved wood) picture frames, along with increasing numbers of small-scale domestic paintings, fulfilled this desire and enabled families such as the Ribots to make a comfortable living. Works in public collections include Still life with dead birds and a basket of oysters, Cleveland Museum of Art, and Les marmitons, York Museums Trust.